If you’re looking for other like-minded individuals with whom you can volunteer to raise awareness about GMOs in your country, the following list represents various Facebook pages that have been set up to help people connect with others in their own country. If you can’t find your country listed below, GMO-Free Europe’s website maintains extensive resources, organized alphabetically by country in the left margin of this page… simply click on the name of a country to learn more. Spanish pages: If any of these pages represent a specific country that you can identify, please comment below! Yes we do have OGM’s in Italy! Not as many as the U.S. but Monsanto has it’s foot in the door here! I can’t see a Norwegian group, but I know some people who are quite active on this matter. If you can talk to the people you know and see if they’re willing to leave a comment here (or on our Facebook page), I’ll be happy to list their group! I found one, though it’s very inactive. Do you think it would be good to have Canada and US in the list with a link to their respective pages? I wonder if people might miss the opening bit. Hi Gmo Awareness. Here’s Marc from Brasil sem Monsanto. Milliones sem Monsanto is from Argentina and Terra sem Transgenicos from Brazil. There’s also a new group in Brazil called Marcha Contra Monsanto https://www.facebook.com/MarchaContraMonsantoSP. Regards. Marc thank you so much! I’ll update this page right away. Please Add My Page, Thanks! Also someone should contact OregonRightToKnow.org and tell them to fix their donation form to allow for people outside the US to donate. Oregon state law allows for people outside the United States to donate to political campaigns. The web company refuses to fix the form. Oregon Right to Know was 128 votes short as of yesterday. 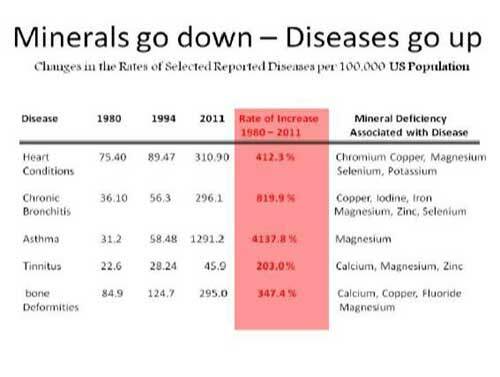 http://media.mercola.com/ImageServer/Public/2014/May/mineral-deficiency.jpg What do you think of this chart tracking drop in mineralization along with ammonium nitrate, pesticide, herbicide, fungicide used in agriculture? Notice how gmo and glyposhate is that much worse? As demineralization increases, disease rates rise, as indicated in the following chart. Dr. Dunning also scoured the archives of the CDC, NIH, American Heart Association, and other agencies, tracking the incidence of disease over the same periods, and came up with the second chart below. As you can see, a very clear pattern emerges when all this information is combined. If a person does a projection on cancer, obesity, bone deformities, heart conditions, asthma, tinnitis, what do you think will happen? Do you think that this information is significant enough to be sharing with others? We have GMO Free Cebu in the Philippines. we also have Cebu Farmers Market as a GMO Free Cebu initiative. You can look up both names on Facebook. If you’d like more info about our campaign, please feel free to send me an e-mail. Hello! We’d love to add you. Can you provide the URL that you want listed? We found a number of different GMO Free Cebu pages on Facebook… thanks!